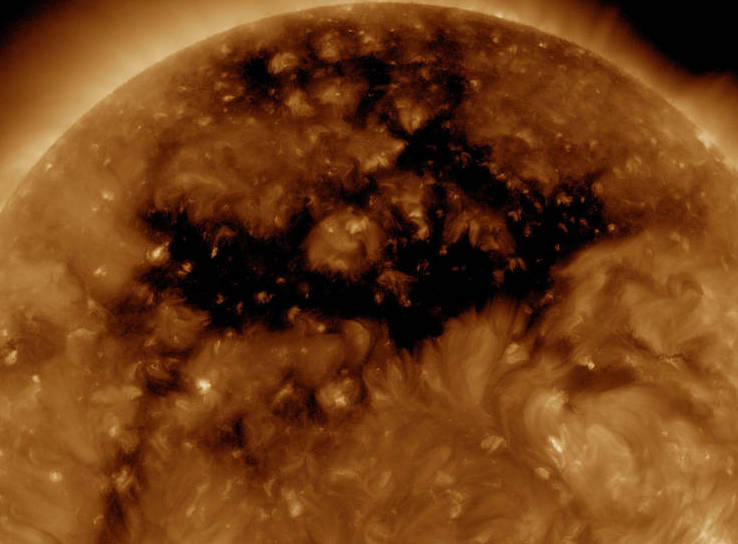 Don’t be alarmed, but NASA says a massive hole just opened up on the Sun, sending out “coronal material” out into space. Oh, good, as if it wasn’t hot enough already. Looking at the above picture NASA shared with the news, and the sun looks downright terrifying. It is going to be Halloween in a few weeks, so perhaps the Sun is simply trying to get into the holiday spirit. Either that or it’s ready to swallow us whole. What you’re seeing is actually called a high-speed solar wind stream, NASA said. The Sun’s corona is darker and colder, and has lower-density plasma because there is lower energy and gas levels. The corona constantly changes and reshapes because the corona is not uniform. The hole that opened up is estimated to be about the size of 50 Earths, which is astoundingly large. Luckily scientists say we have nothing to worry about, though that still doesn’t change the fact that it looks like the Sun is imploding on itself. Coronal holes actually occur frequently, so this isn’t particularly new. The size is what’s notable—50 Earths!